Modern Blinds is now offering 15% OFF ALL SHUTTERS! We offer a range of aluminium shutters that are perfect for both internal and external applications. View our selection of shutters online or visit our showroom in Southport today. Aluminium shutters offer the ultimate in style and efficiency. Our plantation shutters are not only elegant and sophisticated, but they can be matched to any décor, enhancing any indoor or outdoor living space. Our range of shutters consist of four painted colours in a high UV powder coated finish that won’t chip or fade over time and can stand up to the harsh Australian sun. With colours like Pearl White, White Birch, Precious Silver and Black, you’ll be able to match your aluminium plantation shutters to the rest of your home or office. Our aluminium shutters are more than just a pretty façade. Manufactured with T5 aluminium, which is often used in the aviation industry, these shutters are known for their strength and durability. They are low maintenance, easy to clean, and resistant to fading and rusting from the sun and rain. Patios come in all different shapes and sizes, which is where our unique locking system comes in. Our interlocking U Channels, L Frames and T posts will fit whatever configurations you require; even non-square shapes. We can come to you for a no-obligation consultation, measurement and quote of your outdoor area. In no time at all, our team will find the perfect shutters for your needs. To enhance your indoor and outdoor space with aluminium shutters, get in touch today. Call on 07 5591 7777 for the Gold Coast or 07 3290 5777 for Brisbane. Get 15% OFF ALL SHUTTERS DURING OUR EXCLUSIVE SALE! DON’T MISS OUT! Modern Blinds’ Vogue Shutters will make your home or office look modern and beautiful. With our Vogue shutters, you will get the benefits of both unmatched durability and incredible contemporary style; not to mention a 20 year warranty. 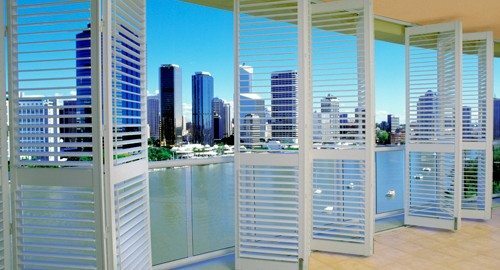 Our vogue shutters are incredibly durable and able to stand up against the harsh and dynamic Australian climate. Our shutters are made with polyresin and finished with a PolySatin solution – this ensures a long-lasting look and feel. Vogue Polyresin shutters might look like painted wood, but their advanced materials mean that they will never warp, crack, fade, chip or peel away. You don’t even have to worry about discolouration – intense sunlight and water is no match for these shutters. Our vogue range is easy to clean too – just apply soap and water when you notice that they’re getting dirty. No matter what style of home you have, our Vogue shutters will be the perfect match. Suitable for both indoor and outdoor applications, our range can cover everything from your bedroom windows to your patio and verandah. Our sophisticated designs are made to suit your needs. You can choose between White, Pearl and Vanilla, as well as a range of other stylish valances and distinctive frames. We can custom-design your shutters to perfectly fit you needs. Choose between three unique louvre sizes in hinged, sliding or bi-fold designs. With a rotation capacity of 180 degrees in either direction, our vogue shutters are easy to control. You can protect against the elements while enjoying a clear, unobstructed view of the outdoors. Their thermal insulation reduces the heat that enters your property by up to 58%. This means less money spent on heating cooling and less strain on the environment. All of our shutters are on sale now for 15% off! Speak to us today and we’ll come to you for a FREE, no-obligation consultation, measure and quote. Visit our showroom today or call us on 07 5591 7777 (Gold Coast) or 07 3290 5777 (Brisbane).